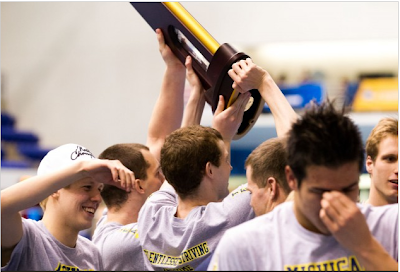 Division I National Champion Michigan Swimming had a bit of a Division III feel to it this past weekend. More specifically, some may say Michigan reeked of Kenyon Swimming. As a proud alumn of their coaching staff, a friend of Jim Steen, and a guy that stood on deck while Dr. Josh White swam for the Lords, I am pretty damn proud to be a Division III coach today. Dr. Josh White on the left. Coach Bottom in the middle. 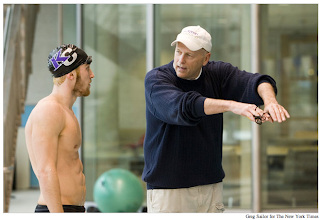 Mike Bottom has been working alongside Kenyon great Jim Steen for well over a decade as he loved Jim's idea of an "elite sprint camp." While Coach Bottom was coaching the likes of Gary Hall Jr., Anthony Ervin, Duje Draganja, and Michael Cavic, he was always humble enough to come to Kenyon College each summer to learn, listen, and share ideas with Coach Steen, the campers... and about a dozen college coaches that volunteered that week! It was an awesome friendship to bear witness to - especially for the swim nerd that knew he was sitting in the room with two of the most innovative and successful swim coaches the world will ever know. Rumor has it one day, after Josh absolutely killed his first year of coaching at Division III Pomona Pitzer, he was at the camp sharing some of his knowledge with the campers and Coach Bottom became intrigued. A discussion occurred after dinner that evening, and after hours and hours of talking, Josh was easily anointed an expert in all things swimming. Coach Bottom quickly trusted his gut and offered Josh a job - a not so usual first pick for head assistant when you are an Olympic Gold medal coach, and one of the most powerful coaches in Division I (with 100's killing to work alongside you). What you must know is that Josh is a proud Kenyon alumn, and a rock star academically. 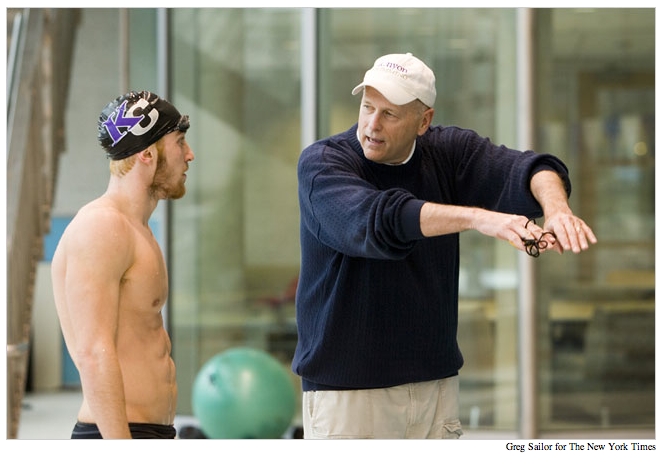 After winning national titles at Kenyon, graduating at the top of his class, and a few years at IU getting his doctorate, his knowledge of swimming - and the science of the sport - was off the charts. (I have read his final dissertation 10 times and still understand half of it, but more importantly, know that every time I read it I am getting smarter and better). Five years later, Michigan is in the running for a national title. The now 'Associate Head Coach', Dr. Josh White (KC '01) is leading the distance group to amazing success. 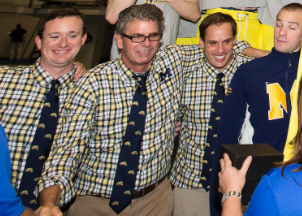 In addition, Zach Turk (KC '12), (Division III national record holder in the 50 and 100 free), takes his final year of eligibility to Michigan and becomes what many feel was the final piece to their sprint relays. The piece that puts them in contention for that team title. You think Sprint Camp at Kenyon pays off?! Low and behold, Michigan wins it all. Both Josh and Zach talk at length in interviews about what an honor it is to swim/coach alongside Coach Bottom. He truly is in it for the right reasons, and doing it the right way. And I gotta believe, Coach Bottom is very proud right now of all that he accomplished and the way he did it... and also thankful for his connection to Division III swimming, and some of the true stars that can come out of our world. Coach Steen, you should be proud. Your influence, belief, and teaching have impacted every level of this sport. PS - Josh's classmate, teammate, and best friend, Jessen Book is now leading the Lords and Ladies of Kenyon, and having some success himself. I was just too lucky to spend time at Kenyon when I did!